Adventure awaits us in Nepal! 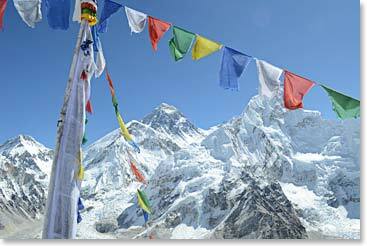 Join us as we travel through the beautiful Khumbu Region on our way to Everest Base Camp. Our trek will take us through colorful villages, to ancient monasteries, along rushing rivers and beneath the towering peaks of the Himalaya. We will climb Kala Patar which stands at an impressive 18,500ft/5,640m and spend a day enjoying the comraderie and excitement of Everest Base Camp at 17,500ft/5333m. Follow along as we post dispatches along the way! May 5, 2012 – Dave and Joanne at Everest Base Camp!